Doshin the Giant (GC): COMPLETED! Oh Doshin, you big lump with your slow legs and your slightly inappropriate belly button. Such a relaxing game, even when the disasters come and threaten to destroy all your little people and their houses and monuments and chickens. Slightly spoiling the relaxing gameplay was a bizarre bug I came across which is probably due to the fact I was running this under emulation and via a Steam Link: Two islands I’d set up and had my people building stuff had all their buildings deleted every time I looked at the list of monuments I’d not yet built. Very odd, and took me ages to realise that was the cause so I probably played for five hours longer than necessary. That aside though, the slow pace and the nice music and the simple gameplay is always a joy. Even if everyone dies in the end. Oh, spoilers, sorry. The post Doshin the Giant (GC): COMPLETED! appeared first on deKay's Gaming Diary. I’ve been playing this a lot over the last few days. It’s not perfect. From the outside it looks like a tedious tree moving game, and there’s not actually much more to it than that, but it has a hook. Part of it is “growing”. At the start of each day, Doshin returns to his normal size, which means he can’t pick up certain things and flattens ground and walks slowly. Making the little people live (or alternatively, hate) him enough makes him grow, and therefore do more stuff more quickly. The ultimate aim is to get all the little people to build every variation of monument they can. You do this by helping them expand their villages (provide them with trees and flat land, mainly), and if you populate them with the right colours of tribes, they create a statue. One of the statues looks like a poo. So far, I’ve managed to coax them into creating 8 or 9 of the 16 or so required monuments. The post Doshin the Giant (GC) appeared first on deKay's Gaming Diary. Yes! After only twelve years, it's done! And people said it was a short game! In fairness, it is a short game, and not overly difficult, but it's actually significantly longer than, say, the single-player components of most Call of Duty games. It's infinitely more charming and fun. Overall, the game took me about 9 hours to complete, and that was including a bit near the end where I ran around the whole house trying to find the last few boos. 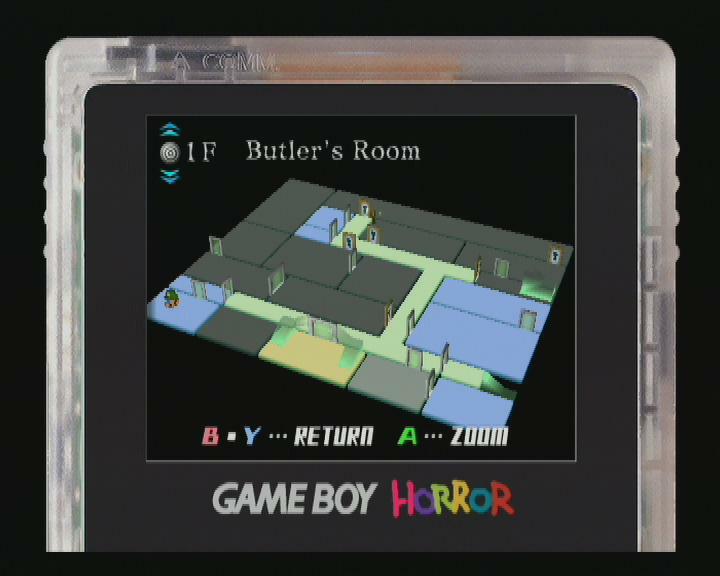 I had collected most of them through normal play, but there were some hidden in Level 1 rooms which I had completed before acquiring the scanner. The game continued to be inventive, the the last moment. 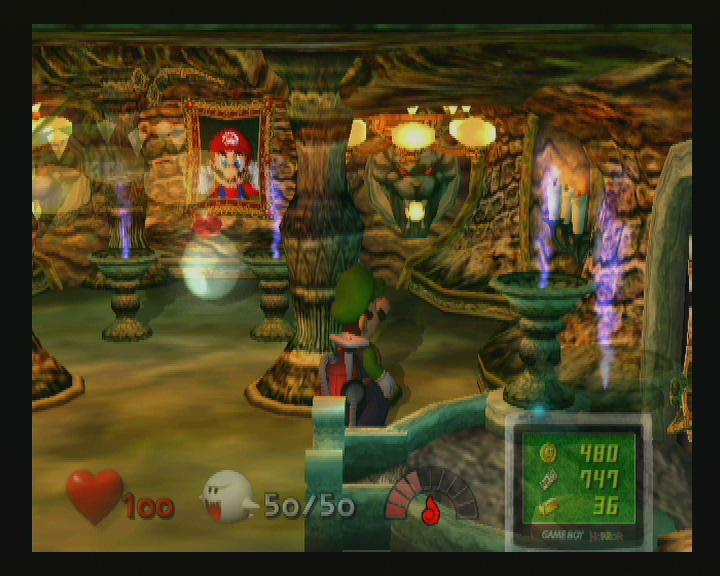 Puzzles were rare and because of this they threw me - having to freeze a stream to cross it was used in only one place, and was an elegant way to prevent early progress. Although the game was actually very linear, it didn't feel like it. ... but it wasn't him, anyway. It took me a couple of attempts, but finally he was defeated (with me on minimal health). I actually remembered to capture it on my video box for once. 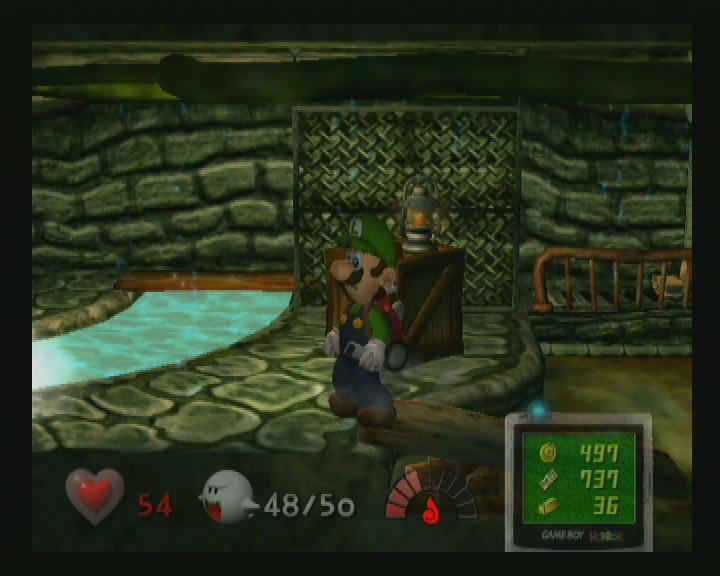 So, game completed and Luigi happy for a while. 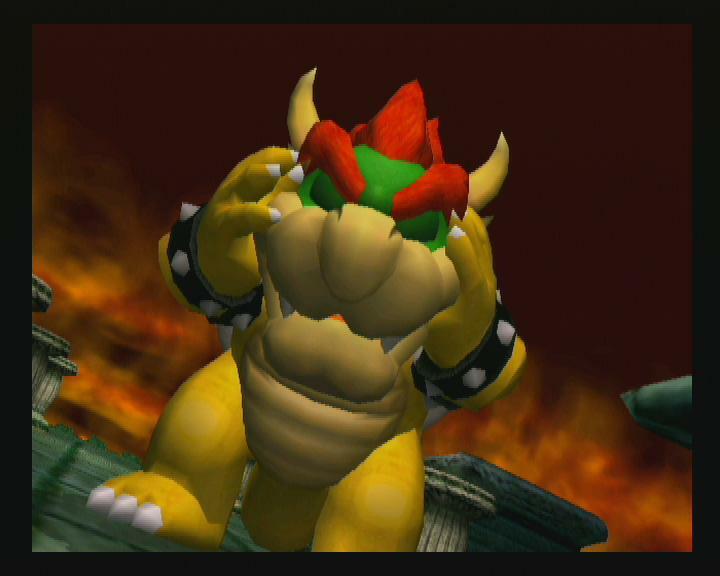 Having seen what he went through, I'm not surprised he's so aggressive in Mario Kart 8. The game is - necessarily - dark and a bit spooky. Which made this part, where you start various instruments playing themselves, a welcome break. Because I was 12 years too late. I didn't buy this at the Gamecube launch, opting instead for Super Monkey Ball and Star Wars Rogue Leader. I bought it a few years ago at a car boot sale, and finally I've started to play it. And it's marvellous. 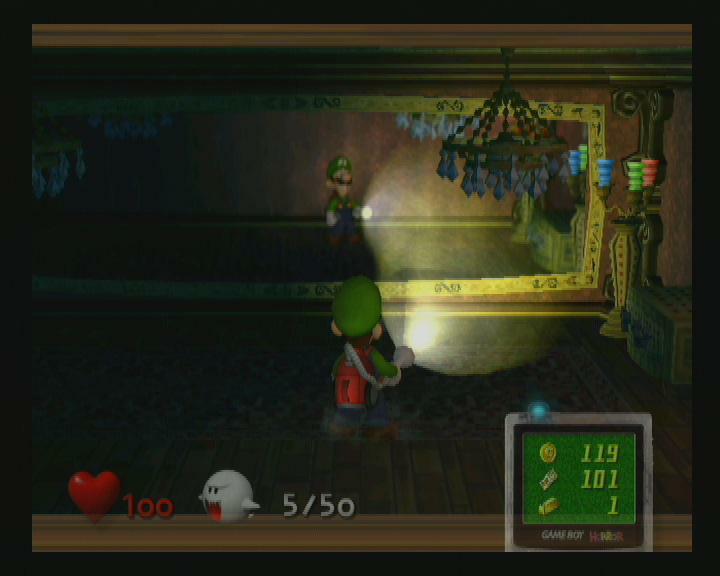 The gameplay is a little dated now, granted, and the controls are taking a bit of getting used to - in particular, the torch control doesn't shine in the direction you point the C-stick, but rather rotates left and right and points up and down; combined with the fixed camera position it makes the frantic ghost catching more difficult than it should otherwise be. Pointing the torch or vacuum up and down seems a little pointless as well. 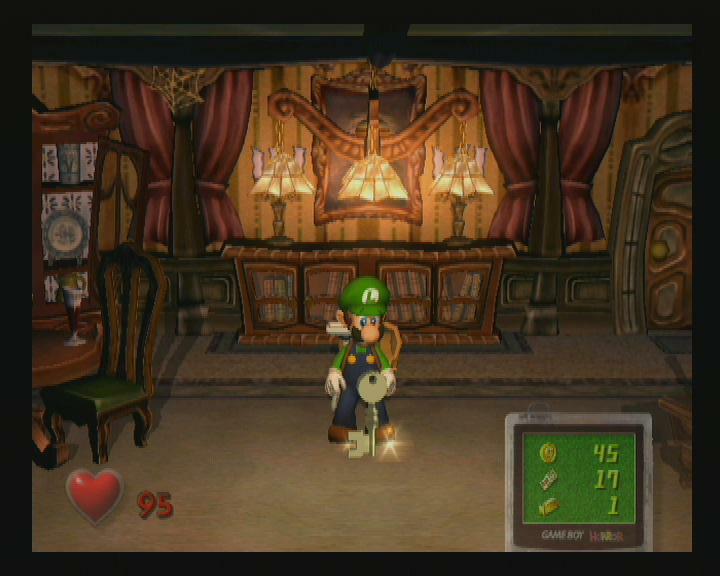 Part of the difficulty comes from the fact that the controls on Luigi's Ghost Mansion in Nintendoland are more like a twin-stick shooter. But control grumbles aside, it remains very playable. It is a relatively little game, but as with all Mario games it is constantly innovative. You never feel like you've played a section before, and even when the enemies repeat they are presented in a new way. For example, toward the end of my play session I went into a room where the standard enemies were invisible and only showed in the mirror that ran the length of the room. I've completed the first area now, and well through the second. Apparently the game lasts for about seven hours - which is probably the same as a Call of Duty campaign. Probably less blood. Ico starts off slowly, with a long cutscene. You get thrown into a murky world and have to work out the controls. The world's not actually murky, but playing it on my HD TV certainly made it look so. I worked my way through the castle, until I found the girl in white. I knocked the cage down the tower, and rescued her from the shadow monsters. I then couldn't find a way out of the room. Huh. Never mind, I thought, I'll come back to that later. I'd been playing for 40 minutes or so. I turned the console off, and then thought ... hmm, I wonder if the game does save at checkpoints? I have only ever played this for five minutes, and it made my head hurt. The end sequence will probably stay with me for a long time - but only when combined with the crash scene and hospital bed at the bottom of the cave. I only played this a couple of times, at the Trocadero. The machine felt huge, and even before getting on the platform you felt energised by the lights and colours. I had seen someone playing already, so knew what to expect, but the first time that two arrows came up the screen at the same time still threw me off guard. Unfortunately none of the home versions quite hit the same spot, partially because of crappy dance mats. A four-player cabinet at the bowling alley in Bexleyheath. I had just learnt to let the back drift out and powerslide around the corners, and overtook my friend John doing so. He shouted at me that it wasn't a powerslide, just a lucky skid. So I did it again the next race. I actually remember this more from my playthrough on the PSP, given the use of save states which allowed me to actually complete the game. There were a number of memorable points, but the best was chasing the madman across the map in his speedboat at the end of the penultimate level. I was raining missiles on the speedboat the whole time and it didn't explode. Of course not; where would the last level come in if that happened? The instructions speeding up a few bars into Don't Stop Me Now. We played this again recently, and it's still great. 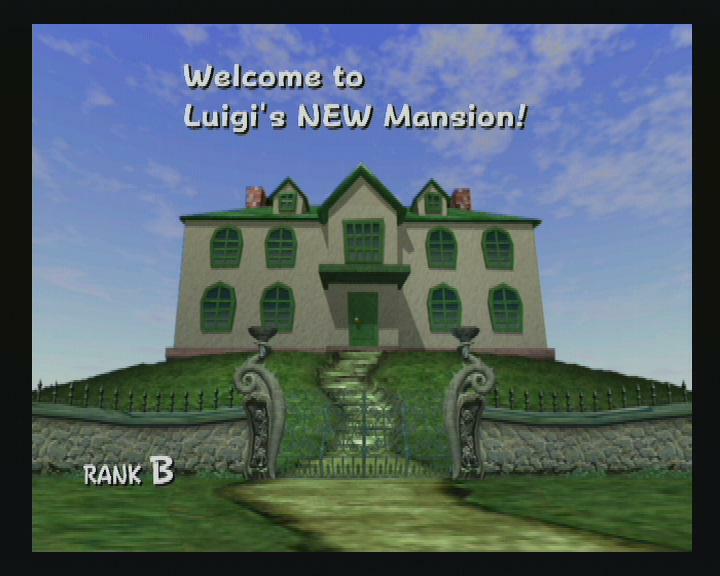 I played this when it was first released, back in 2002, to completion. I can remember very little of it now, other than the moment when I first realised you could pick up and throw villagers. I did it many times and they all hated me, so I had to restart the day. Being unable to move left at the start of the game, and audio cutting out. I thought the game was broken; evidently not. Meeting an NPC called Phil at the end of a long cave, who informed me that he was just there to fill space. The ending of the game not actually being the ending of the game unless you buy some DLC and finish it. I have never completed the last level because it was just too hard.